I think my Green Party team and I are justified in our claims to be a little more tired than other candidates and agents following the events of Friday night and into Saturday morning. The South Belfast count was the last to be wrapped up and it was around 4am on Saturday morning before my re-election was finally confirmed. We drifted away from the Titanic Quarter to fall into our beds. The Belfast count centre was almost empty when Chris Stalford and I were formally returned. As I embraced my wonderful green team it felt like we owned the huge space and everything was about our success, if only for around 20 surreal seconds. I understood at that moment that my election may well have killed off the veto carved out by the traditional parties for themselves through the abuse of the petition of concern. I had been tipped to lose my seat by many commentators but here I was proudly wearing my Trust Women t-shirt, surrounded by a progressive, diverse, passionate but exhausted band of Green Party supporters. We believed then that we may have driven the nail in the coffin of a veto which has propped up regressive politics for too long now. Twitter was lit up by it all with #awake4bailey trending across the UK. Oh the beautiful irony of that moment! Our joy is short lived however. Sleep and media interviews were priorities this weekend but now I’m ready for the business at hand. I cannot celebrate retaining my job for very long when the election was entirely unnecessary in the first place and so many people in South Belfast are sitting on protective notice, because of the absence of an Executive budget. As tired as I felt on Saturday, I understand how tired people have become with dysfunctional Northern Ireland politics as typified by the dire previous Executive. I’ll be working with my Party Leader Steven Agnew to do everything possible to revive the Assembly and ensure that accountability, transparency and delivery are central tenents in the future. As for the petition of concern, we will have to see whether this election ushers in a new era of inclusive, productive government. I’ll be prioritising marriage equality and the decriminalisation of abortion in the next mandate. More notably, voting alongside my two children and hoping for progressive politics and a better Northern Ireland for their sake. 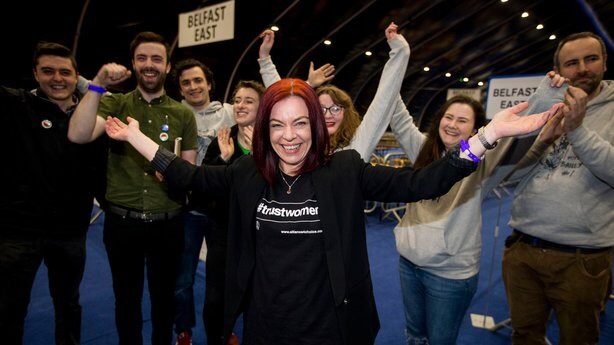 Embracing my team at 4am in an almost empty Belfast count centre and believing that, for around 20 seconds, it was all about us.